Fewer than 200 Allard J2 and J2X models were produced in just three years. Allards certainly entered the public’s consciousness in a big way for American toy makers to go into production of toys derived from such a small overseas car maker. Aside from a grainy photo of what purports to be a K-series Allard pedal car manufactured in England, I know of no English or European toy makers who made any Allard – even though prolific toy makers such as Dinky and Corgi produced models of many 1950's cars. - PAYTON PRODUCTS INC of New York made a 6 ½" long soft plastic Allard with snap-in plastic axles and wheels. The toy came in many colors with the plastic wheels and the steering wheel in a contrasting color, and a paper flag sticker. The toy retailed for 49 cents. Payton ‘soft’ plastic Allards with one of the toys in its original point-of-sale package with somebody else’s flag on the boot! The Payton Allard was also offered in a boxed set packaged in an attractive multi-color 11" by 11 ½" box. The other cars in the set were: Healey, Jaguar, and LeSabre. At least, in the set, they did get the British flag on the boot lid of the Allard. Payton Allard in boxed set with other 1950’s open cars. “Allard” is printed next to car on box lid and on the box insert. Colorful box surely promoted sales. - PREMIER PRODUCTS CO of Brooklyn NY produced a 4 ½" long, highly detailed Allard with small hoops to simulate windscreens. The spoke wheels and axles were one molded plastic piece that snapped into holders on the underside of the body. Premier Plastics Allards were produced in many primary colors. However the candy in little Joyce’s Christmas stocking took priority over this yellow Allard in her young mind. - NOSCO PLASTICS of Erie, PA was originally the National Organ Supply Co that morphed into plastics and toys after the war, when the demand for organs declined. NOSCO was well known in the 1950's for producing gazillions of tiny plastic ‘prizes’ destined for Cracker Jack boxes. The NOSCO Allard is made of thick hard plastic and is the largest of the Allard toys at 7 inches. This Allard toy has a strong wind-up motor that powers the front wheels. It has a great deal of detail with much silver painted highlighting and multi-colored driver and passenger. The colorful box says “Sport Car”, but we know what it really is, don’t we? 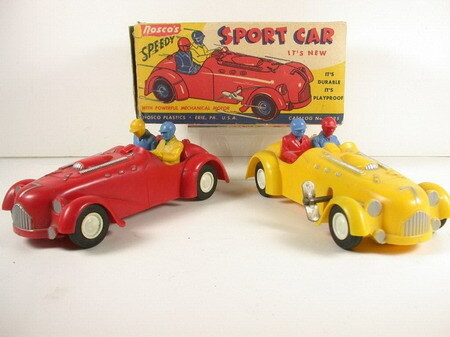 NOSCO hard plastic wind-up “Speedy Sport Car”. It is interesting to note that the NOSCO and the Payton toys have the steering wheel on the left side, while the Premier toy has no dash board or steering wheel. Glue-together plastic and balsa wood Allard model kits so you could build your own and customize your creation with paint or aftermarket accessories were concurrent with the toys. - PREMIER PRODUCTS CO of Brooklyn NY has a 6 ½" long hard plastic body, and a bumper-to-bumper base with glue-on and stick-on trim. The kit includes four rubber wheels with pronged plated tin hubcaps. The body design is very similar to the Payton soft plastic toy. Payton Plastics and Premier Products most certainly were closely connected, if not under the same ownership. This is evidenced by all the other Payton cars, in their boxed set shown above, appearing on the side of the Premier Allard Model Kit box being shown as other Model Kits then currently available from Premier. Premier model kit with body shell and parts on the left, completed model on right. - BERKELEY MODELS INC of West Hempstead NY made an Allard model kit that is well out of the ordinary, as it came with a barely roughed out 6 ½" long block of balsa wood to be shaped into the body. The fenders, headlights, steering wheel, gas cap, gear shift, and shocks are made from a kind of heavy cast pot metal and have prongs to attach them into the soft wood. The upholstery provided is a small piece of patterned brown vinyl. The wheels and hub caps are identical to the Premier model above, and include wheels and caps for two sidemounts. There are water decals for a detailed dashboard, portholes, hinges, louvers, bonnet straps and bonnet grille. The license plate reads “SX-42-79”. The exhaust pipes, which were to protrude from the rear, were to be soda straws! 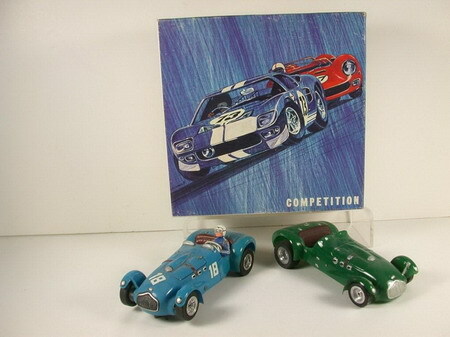 The Berkeley box shows the same Jaguar, Healy, and the LeSabre model kits from Premier, and toys from Peyton – giving further evidence of a relationship between the two companies. The instruction sheet stated that Fire Engine Red was the “color of choice”. I have never seen one of these models in its completed form. Balsa wood bodied Berkeley model kit with some of the ‘jewelry castings’ shown. - ATLAS TOOL COMPANY of Hillside NJ produced an HO scale Allard JR LeMans model kit with the car’s body being a tiny 2 ¼ “ long. The kit comes on a cardboard card on the back of which are assembly instructions, and a very nice write-up about Allards and specifically about this “J-2-R Le Mans”. The kit includes two separate duplicate ‘trees’ of small parts. One is in ‘chrome’ and the other in a contrasting color to the body. The instructions describe how one may assemble a “Stock” or a “Custom” version by mixing and matching the parts and decals. The kits came in many colors. Two un-opened Atlas Tool Allard kits. chassis. 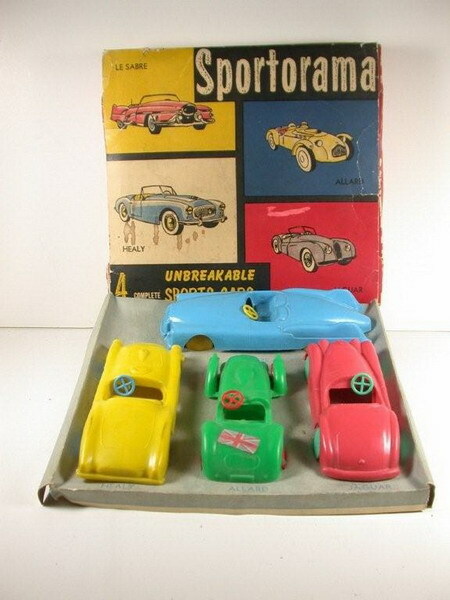 The Pactra multi-purpose box shown states that it contains a “ready to race, super-detailed ALLARD J2X” and the box retains it’s price sticker for $12.98. 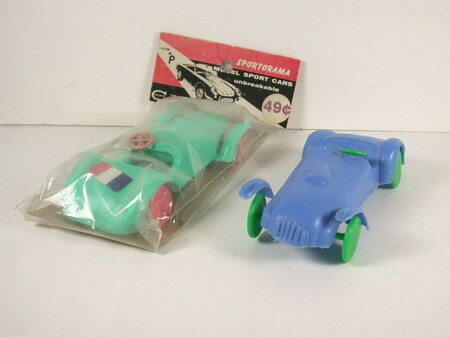 A pair of PACTRA/COMPETITION Allard slot cars – one straight out of the box, and one with added driver, steering wheel, numerals and windscreen. Toy makers, over the ages, often produce automotive toys that represent especially attractive and widely known vehicles currently on the road to catch the interest of buyers. It is an exceptional tribute to the recognition achieved by Sydney Allard’s J2 and J2X models that toy makers from both coasts went to the considerable cost of making the expensive injection molds to produce such a variety of toy Allards. All these toy makers are long gone with their short time in business leaving little history of their operations behind. However, the Allard toys that they made can still be found, thereby celebrating the toy’s makers and our beloved Allards. Questions and any and all further information relating to Allard toys of any type is solicited and would be most welcomed by the author.